A production video company helps businesses curate videos designed to boost brand awareness and conversion rates. Contact IndieWhip for more info! Little did early filmmakers know that video would soon be one of the most used media by companies who want to market their products and services. Business owners across the globe constantly search for the best ways to produce quality video content. There are several options you can take if you plan on putting out branded entertainment. You can hire a freelance filmmaker, create an in-house production team, or hire the services of a production video company. While all these have their own pros and cons, hiring the creative services of a production video company that is specializing in marketing offers benefits that other methods do not. IndieWhip is a production video company that caters to various brands and businesses. As a production video company, we take pride in our exceptional client portfolio that includes brands and organizations known nationally and internationally. Read more about who we are here! While producing hundreds of quality video content, we have accumulated knowledge on the ins and outs of marketing. That’s why we know all too well what it takes for a production video company to bring their clients to the top. Here are some of the benefits of hiring the services of a production video company such as IndieWhip to handle your video outputs. You might think that having your own in-house team to create video content is more time-efficient, but there are cases where hiring a production video company is actually more productive. Working with a production video company offers business owners the freedom to focus on other important business matters. As a production video company, it’s our duty to create high-quality, creative videos and films that help you achieve your goal. Whether you want client growth, brand recognition, or increased sales, your production video company should be competent enough to help you reach those goals. Turn to IndieWhip if you are looking for an innovative production video company. We don’t just make videos or films; we create output designed to impress audiences and elicit positives reactions from them. What makes us a unique production video company is the fact that we go the extra mile to get to know each one of our clients. As a production video company, we believe that at the heart of every viral, engaging video is passion. We don’t just create a generic sales video presentation and call it yours. IndieWhip is a production video company that makes sure to deliver your message to your intended audience in a creative way that is uniquely yours. Here at IndieWhip, we’re a production video company that gives you exactly what you want. During the process, our group of professionals will constantly keep in touch with you to create an original, unique, and captivating clip that’ll help you achieve your goal. Click here to learn more about the advantages of hiring a video production company: https://www.linkedin.com/pulse/should-you-hire-professional-video-production-company-kelly-burke/. How Do I Know If I Should Work With a Production Video Company? 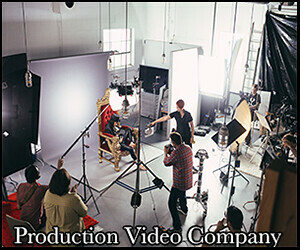 The main goal of a production video company is to create compelling videos and films geared toward a certain goal. While you may be able to create quality content on your own, it may be much faster and more efficient to let a third party handle the work for you. Overall, production companies are here to help you get the most results out of every marketing campaign. Looking for a Top-Notch Production Video Company? Do you need a production video company to take your brand to new heights? Then get in touch with us at IndieWhip, your go-to production video company. We’ll help you reach the next level using our unrivaled knowledge in creating video content. If you’re still not convinced of our capabilities as a production video company, just take a quick look at some of the brands we have worked with. We guarantee that our methods are efficient, results-driven, and of course, fun! In today’s fast-growing global marketplace, effective brand marketing is necessary for businesses to succeed. One of the best ways to attract and engage your target audience is through video. A high-quality, well-produced video, whether it’s a short film or an infomercial, can get potential customers interested in your products or services. Give your brand the marketing push it deserves through IndieWhip. IndieWhip creates engrossing video content that will not only help you increase brand awareness but also let you connect with your audience on a personal level. Our team has both the technical ability and the creative drive needed to develop motion pictures that stand out from the crowd. It’s no secret that creating a successful video project can take time, patience, and a lot of work. If you want to jump-start your video marketing campaign but don’t know how, reach out to IndieWhip. At our video production company, we collaborate with clients to produce multimedia content that fits their specific needs. We love what we do, and we are passionate about helping you tell your story. Through hard work, focus, and precision, we’ve sculpted a system that lets us develop unique video content that speaks directly to your target audience. Unlike in traditional business dealings, we make it a point to foster deep relationships with our clients. This helps us tailor the video content to your particular brand marketing goals. Let us get to know you, how you work, and what you want to say. When you allow us to understand your objectives, we can use the magic of motion picture and our creative techniques to bring your vision to life. What we do is simple: We create videos. Motion pictures are our tools of choice. From commercials to shows, we can take on any video production project. Our creative team is well versed in the art of using sight, sound, and emotion to tell compelling stories. We work with hundreds of talented individuals across the globe to produce motion pictures that educate, interest, and attract your customer base. We use a story-driven approach to video production. With state-of-the-art motion graphics, thoughtful planning, and clever camerawork, we help businesses market their brands in engaging and artistic yet concise ways. To break up the monotony found in typical a film or video, we engage the audience through subtle camera movements, clever editing, and precise audio engineering. If you let us create your project, we can help you connect with your target market and gain their trust and loyalty. Sheaffer Pen & Art Supply Co. Using film for your company is a great way to showcase what you have to offer and reach your target market. With help from the professionals at IndieWhip, you can use motion pictures to pique customer interest in your brand and get ahead of the marketing game. Interested in working with our creative team on your next video production? You can reach us by calling 508-469-0148, emailing info@indiewhip.com, or sending us a message through our online form. Partner with us, and we’ll help you bring a human touch to your marketing campaign.